Being able to sync efficiently with the desktop is, we believe, one of the most important aspects of a smartphone. The iPhone does this incredibly well, thanks to tight integration with iTunes, but Android doesn’t. However, by making use of a handful of apps, you can get a similar experience. One such app is Cheetah Sync. 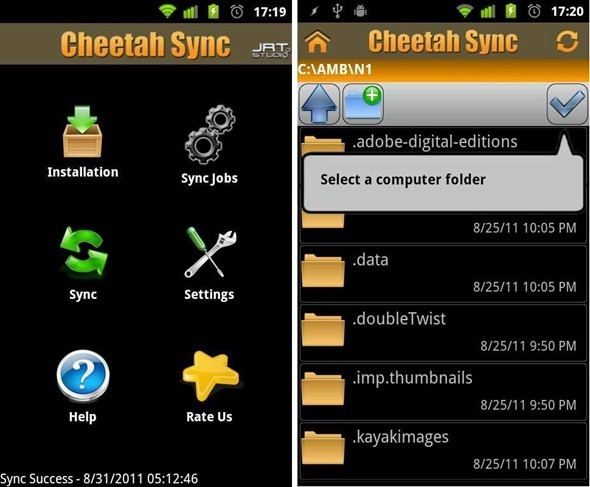 Developed by JRTStudio, Cheetah Sync for Android lets users synchronize folders (by creating what the app calls ‘Jobs’) between their Android device and their Windows or Mac computer. This syncing is done over Wi-Fi, so it quicker than services like Dropbox which upload to the cloud. To set it up you first need to install the app on your phone and then on your computer. After connecting both up, you create ‘jobs’ which lets you choose a specific folder on Android and then a specific folder on your computer. These two folders are then, well, kept in sync! However, syncing isn’t automatic; users have to tap Sync from Android app each time they want to update the folder on either device (phone/PC). Cheetah Sync is a brand new solution for keeping files on your computer and Android device in sync. You can now have your pictures, important documents, music and videos from your computer on the go! Just select a folder on your computer, a folder on your Android device, and let Cheetah Sync keep the files in sync! There are alternatives to Cheetah Sync which have the same objective: to transfer files from Android to your PC wirelessly and with the tap of a virtual button. I have personally used Dropbox all along for this sort of stuff, but I understand that the charm in Cheetah Sync is how you can create ‘jobs’ so that folder X on your Android phone always stays synchronized with folder Y on your PC. Thanks to Cheetah Sync, folks will now be able to keep their music, photos and documents in sync. Transferring over Wi-Fi might even become slow at uncertain times, so if it is speed that you’re looking for, you’ll want to connect via USB and transfer from there. We’ve personally tested the app on our Samsung Galaxy S II unit and can confirm that it works as advertised. The app itself is free, but if you wish to have unlimited jobs, you will have to pay up $1.49 through an in-app purchase. Be sure to check out our Android Apps gallery to explore more apps for your Android device. You can follow us on Twitter or join our Facebook fanpage to keep yourself updated on all the latest from Microsoft, Google, Apple and the web!